Background: In this study, we aimed to evaluate the effectiveness of extracorporeal shockwave treatment (ESWT) on pain and ankle-hindfoot scale of the American Orthopedic Foot and Ankle Society (AOFAS) score of patients with chronic Achilles tendinopathy (AT). 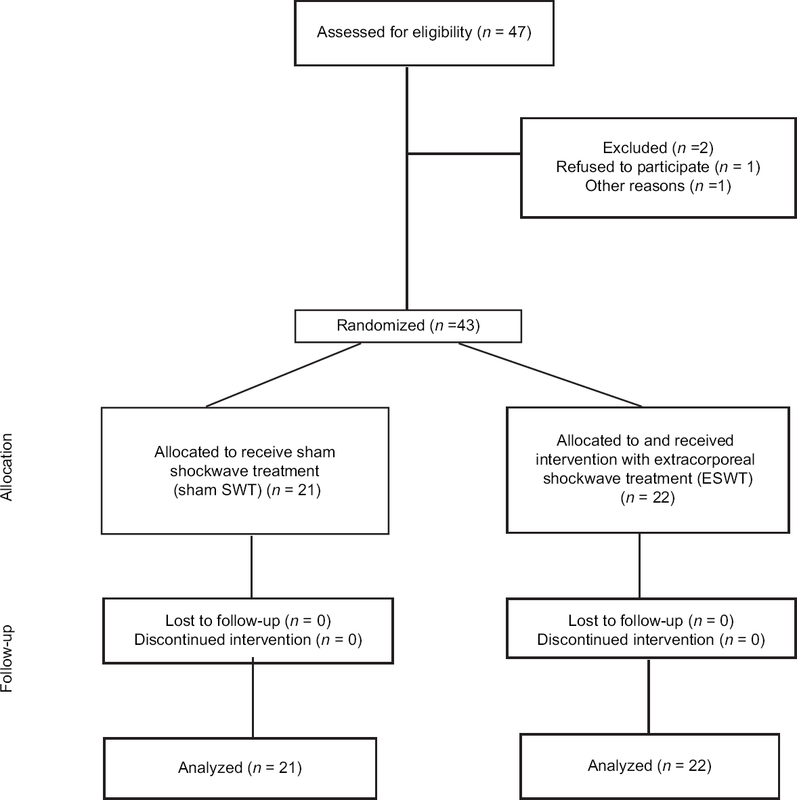 Materials and Methods: In this double-blind clinical trial, 43 patients with chronic AT were selected and randomly allocated in two groups to receive a basic treatment with ESWT or sham SWT (radial and focused shock waves, four sessions once a week for 4 weeks). AOFAS and pain scores for each patient were recorded at baseline (before intervention), immediately after intervention, and 4 and 16 weeks after intervention using AOFAS and visual analog scale (VAS) scaling method. Results: A total of 43 patients (22 ESWT and 21 sham SWT) were participated in this study. Both groups improved during the treatment and follow-up period. The mean VAS score decreased from 7.55 to 3 in the intervention group and from 7.70 to 4.30 in the sham SWT group. Mean AOFAS and VAS scores were significantly different between ESWT and no ESWT groups at 16 weeks of follow-up (P = 0.013) (P = 0.47). There was no significant difference in terms of AOFAS and VAS scores between both the groups in the other follow-up times. Conclusion: Overall, ESWT causes decrease in VAS score and increase in AOFAS score. However, due to the small sample size, the results were not statistically significant. It is recommended to plan more interventional studies with larger sample size in the future. Different conservative treatment options including eccentric exercise, physiotherapy, and high-volume image-guided injections have been introduced and are used for symptoms relief of AT. The mentioned treatments have short-term effect and some studies have reported that some other treatment options including extracorporeal shockwave treatment (ESWT) and sclerosing agents provide longer effects and could be used in cases which fail to respond to conservative treatments. Recent in vivo study indicated that the possible mechanism of action of ESWT in the regeneration of tendinopathy is promoting of pro-inflammatory and catabolic processes during the first phase of regeneration, which results in the improvement of matrix turnover. In nonresponder patients to ESWT, the biological response of the individuals is different from responder ones. Although some review studies reported the benefits of ESWT in the treatment of AT, considering the mechanisms of ESWT action and the possibility of different effect in different populations and also different protocols of ESWT treatment, we aimed to evaluate the effectiveness of ESWT in the treatment of chronic AT in our population. This study was designed as a double-blinded clinical trial. During this study, 43 patients with chronic AT aged 18–70 years who referred to outpatient physical medicine and rehabilitation clinics affiliated to Isfahan University of Medical Sciences were enrolled. The study was conducted from March 2014 to March 2015. Regional ethics committee and the review board of Physical Medicine and Rehabilitation Department of Isfahan University of Medical Sciences approved the protocol of the study (research project number: 394077). Tenderness in exacerbated dorsiflexion of the ankle. Patients with chronic AT who were new cases of the disease and were under treatment with the first-line treatment (analgesic and physical therapy) were included. Patients who received ESWT during the past 6 months, were under treatment of nonsteroidal anti-inflammatory drugs 1 week before receiving ESWT, had steroid injection or physiotherapy during the past 3 months, had a history of any concomitant diseases including diabetes and polyneuropathies, having any anatomic foot deformity, and having history of heel surgery and history of ankle and hind-foot fracture were not enrolled. In addition, pregnant women, addict patients, and those who have history of any inflammatory disorders as well as septic arthritis were not enrolled also. Patients who have not proper cooperation and/or have another additional treatment method or any changes in treatment plan based on his/her physician's recommendation were excluded. Details of the study, treatment strategies, and methods of the study were explained for all selected patients, and written informed consent was obtained from all patients. The trial also was registered in the Iranian Registering of Clinical Trials (IRCT) with the registration number IRCT2016051727907N1. Selected patients were randomly allocated to receive ESWT or not received using Random Allocation Software GNU General Public License version 2.0 (GPLv2) (Boston, USA). All patients examined clinically by a physical medicine and rehabilitation specialist (HF). Baseline characteristics and sign and symptoms of the patients were recorded in their medical files. The specialist was not aware about the allocation of the patients. Simultaneously with the intervention, all patients (both ESWT and no ESWT groups) underwent a conservative physic-supportive treatment plan for 4 weeks which including stretching exercises of cuff muscles, massage with topical drops, and eccentric training. In addition, 100 mg diclofenac sodium was administrated for their daily use for 2 weeks. Patients in ESWT group treated with active treatment of ESWT given at four sessions once a week for 4 weeks. Patients in sham SWT group were placed in the position for ESWT, heard the ticking sound of therapy, but not received any shockwaves. AOFAS and pain scores for each patient were recorded at baseline (before intervention), immediately after intervention, and 4 and 16 weeks after intervention using AOFAS and visual analog scale (VAS) scaling method. A 10-scaling ruler (10 cm) was used for VAS scoring (scaling from no pain  to severe pain ). All selected patients and the observer who evaluated the outcomes were blinded to the type of treatment. Mean AOFAS and VAS scores were compared between and within groups during the mentioned times. ESWT was performed in a prone position using a standard electromagnetic ESWT device of Duolith SD (Storz Medical, EU). Patients in ESWT group treated with 1500 shots of focused shockwaves (0.25–0.4 mJ/mm 2.3 Hz) and 3000 shots of radial shockwaves (1.8–2.6 mJ/mm 2.21 Hz). With an average of 500 shocks, the probe position was changed on a rotating basis. Patients in sham SWT group were placed at the same position and received both the same radial and focused shockwaves but without any energy. ESWT was applied once a week for a 4-week period. Finally, collected data were entered into SPSS, Version 20 (SPSS Inc., Chicago, IL, USA.). Qualitative data in the forms of frequency and frequency percentage and quantitative data in the forms of mean and standard deviation have been demonstrated. As inferential statistics, Fisher's exact test has been applied to compare frequency distribution qualitative variables between two groups. Furthermore, according to the results of Kolmogorov–Smirnov normality test indicating normal distribution of variables, we used independent sample t-test to compare the means of continuous variables between two groups and repeat-measure ANOVA test to compare the means of variables by passing the time from baseline to 16 weeks after intervention in each group. In all analyses, we considered the significance level < 0.05. In this trial, from 47 initially enrolled patients, 43 patients with chronic AT completed the trial in two ESWT (n = 22) and sham SWT (n = 21) groups [Figure 1]. Baseline characteristics of the patients with chronic AT allocated in ESWT and sham SWT groups are presented in [Table 1]. Patients in the two studied groups were similar regarding their demographics and disease characteristics (P > 0.05). Mean AOFAS and VAS scores in both ESWT and sham SWT groups at baseline, immediately after intervention, and 4 and 16 weeks after intervention are presented in [Table 2]. Within-subject analysis showed that in each of the two groups, VAS decreased significantly over time (from baseline to 16 weeks after intervention) (P< 0.001). In contrast, the changes in VAS over time were not significant between the two groups (P > 0.05). Although, in between-group analysis, VAS score in the control group (sham SWT) were more than ESWT at all times, this difference was not significant, and only in the time of 16 weeks after intervention, the VAS score in ESWT group with the mean of 3.00 ± 2.15 was marginally lower than the control group with the mean of 4.30 ± 1.84 (P = 0.047). Finally, VAS changes over time were not significantly different in ESWT group with a mean of −3.70 ± 2.27 in comparison to sham SWT group with a mean of −3.25 ± 0.91 (P = 0.416). On the other hand, the results of the AOFAS within-subject analysis showed that in each of the two groups, AOFAS increased significantly over time (from baseline to 16 weeks after intervention) (P< 0.001). In contrast, the changes in AOFAS over time were not significant between the two groups (P > 0.05). Although, in between-group analysis, AOFAS score in the control group (sham SWT) were less than ESWT at all times, this difference was not significant, and only in the time of 16 weeks after intervention, the AOFAS score in ESWT group with the mean of 85.85 ± 7.88 was significantly higher than the control group with the mean of 79.50 ± 7.53 (P = 0.013). Finally, AOFAS changes over time were not significantly different in ESWT group with the mean of 20.90 ± 13.51 in comparison to sham SWT group with the mean of 15.10 ± 6.88 (P = 0.095). There was not any report of complication related to ESWT. There was not also any report of complication regarding the use of pharmacological treatment in both studied groups. Our findings indicated that ESWT has improving effects both on pain and AOFAS score of patients, but due to the small sample size, the results were not statistically significant. Although there is conflicting evidence about the effectiveness of ESWT in treatment of different tendinopathies, it is a minimally invasive treatment modality which is used on an outpatient basis and could be as an adjunct to therapy to increase the effectiveness of conservative treatment. The frequency of its use is not daily. Another superiority of ESWT is that it could visualize the area of pathology and target the area. As mentioned, some previous studies have evaluated the utility of ESWT in AT management and some review studies also confirmed the improving effect of ESWT in this field,,,,,,,, the number of studies which conducted in this field was not high and only six studies were reported their findings. From the studies, four were clinical trials and only two of them were blinded. In addition, the protocols of ESWT treatment were not similar in the reported studies. Hence, we conducted a double-blinded clinical trial with our recommended ESWT protocol. Costa et al. did not report significant effectiveness for ESWT therapy in 49 patients with chronic AT. They concluded that the obtained result may be due to the small sample size. Rasmussen et al. have reported significant improvement in pain and AOFAS of patients with AT. They followed up the patients for 3 months after intervention and reported significant improvement from 8 weeks after intervention. The design of our study was similar to the study of Rasmussen et al. We followed up for 4 months, and the significant improvement was seen 4 weeks after treatment. Similar to Rasmussen et al., our patients assigned to get ESWT at four sessions once a week for 4 weeks. In the studies of Furia,, the patients received a single dose of ESWT and patients in the study of Costa et al. given three sessions once a month for 3 weeks. Given that the dose of ESWT, its frequency of use, treatment protocols, and outcome measurement variables and their scale were not completely similar in the mentioned studies, it seems that more studies for evaluating mentioned factors are recommended. In this study, we used both focused and radial ESWT. Reports from previous studies in this regard were not consistent, but most of them used only one type of shockwaves.,,,,,,, A recent study indicated that both focused and radial ESWT could be effective in this field. The limitations of the current study were lower sample size and shorter duration of follow-up. It seems that evaluation of the ESWT outcomes 12 months after trial would be helpful for the evaluation of ESWT and its dose. The strength of our study was that patients in two studied group were exactly in the same conditions and were completely similar in each group. In some previous studies, the two studied groups were not similar at baseline in all variables. Overall, ESWT causes decrease in VAS score and increase in AOFAS score. However, due to the small sample size, the results were not statistically significant. It is recommended to plan more interventional studies with larger sample size in the future. Asplund CA, Best TM. Achilles tendon disorders. BMJ 2013;346:f1262. Freedman BR, Gordon JA, Soslowsky LJ. The Achilles tendon: Fundamental properties and mechanisms governing healing. Muscles Ligaments Tendons J 2014;4:245-55. Saltin B, Henriksson J, Nygaard E, Andersen P, Jansson E. Fiber types and metabolic potentials of skeletal muscles in sedentary man and endurance runners. Ann N Y Acad Sci 1977;301:3-29. Aström M, Westlin N. No effect of piroxicam on Achilles tendinopathy. A randomized study of 70 patients. Acta Orthop Scand 1992;63:631-4. Caine D, Cochrane B, Caine C, Zemper E. An epidemiologic investigation of injuries affecting young competitive female gymnasts. Am J Sports Med 1989;17:811-20. Amiel D, Frank C, Harwood F, Fronek J, Akeson W. Tendons and ligaments: A morphological and biochemical comparison. J Orthop Res 1984;1:257-65. Diehl P, Gollwitzer H, Schauwecker J, Tischer T, Gerdesmeyer L. Conservative treatment of chronic tendinopathies. Orthopade 2014;43:183-93. Magnussen RA, Dunn WR, Thomson AB. Nonoperative treatment of midportion Achilles tendinopathy: A systematic review. Clin J Sport Med 2009;19:54-64. Moayednia A, Haghdani S, Khosrawi S, Yousefi E, Vahdatpour B. Long-term effect of extracorporeal shock wave therapy on the treatment of chronic pelvic pain syndrome due to non bacterial prostatitis. J Res Med Sci 2014;19:293-6. Vahdatpour B, Taheri P, Zade AZ, Moradian S. Efficacy of extracorporeal shockwave therapy in frozen shoulder. Int J Prev Med 2014;5:875-81. Furia JP. High-energy extracorporeal shock wave therapy as a treatment for insertional Achilles tendinopathy. Am J Sports Med 2006;34:733-40. Furia JP. High-energy extracorporeal shock wave therapy as a treatment for chronic noninsertional Achilles tendinopathy. Am J Sports Med 2008;36:502-8. Costa ML, Shepstone L, Donell ST, Thomas TL. Shock wave therapy for chronic Achilles tendon pain: A randomized placebo-controlled trial. Clin Orthop Relat Res 2005;440:199-204. Rasmussen S, Christensen M, Mathiesen I, Simonson O. Shockwave therapy for chronic Achilles tendinopathy: A double-blind, randomized clinical trial of efficacy. Acta Orthop 2008;79:249-56. Rompe JD, Nafe B, Furia JP, Maffulli N. Eccentric loading, shock-wave treatment, or a wait-and-see policy for tendinopathy of the main body of tendo Achillis: A randomized controlled trial. Am J Sports Med 2007;35:374-83. Rompe JD, Furia J, Maffulli N. Eccentric loading compared with shock wave treatment for chronic insertional Achilles tendinopathy. A randomized, controlled trial. J Bone Joint Surg Am 2008;90:52-61. Al-Abbad H, Simon JV. The effectiveness of extracorporeal shock wave therapy on chronic Achilles tendinopathy: A systematic review. Foot Ankle Int 2013;34:33-41. Braddom RL. Handbook of Physical Medicine and Rehabilitation. 4th ed. Philadelphia: W.B. Saunders; 2011. p. 634. Andres BM, Murrell GA. Treatment of tendinopathy: What works, what does not, and what is on the horizon. Clin Orthop Relat Res 2008;466:1539-54. Mani-Babu S, Morrissey D, Waugh C, Screen H, Barton C. The effectiveness of extracorporeal shock wave therapy in lower limb tendinopathy: A systematic review. Am J Sports Med 2015;43:752-61. Waugh CM, Morrissey D, Jones E, Riley GP, Langberg H, Screen HR, et al. In vivo biological response to extracorporeal shockwave therapy in human tendinopathy. Eur Cell Mater 2015;29:268-80. Lakshmanan P, O'Doherty DP. Chronic Achilles tendinopathy: Treatment with extracorporeal shock wave. Foot Ankle Surg 2004;10:125-30.